Are you looking for the perfect holiday side dish that is comforting, but you don’t have to feel guilty about? 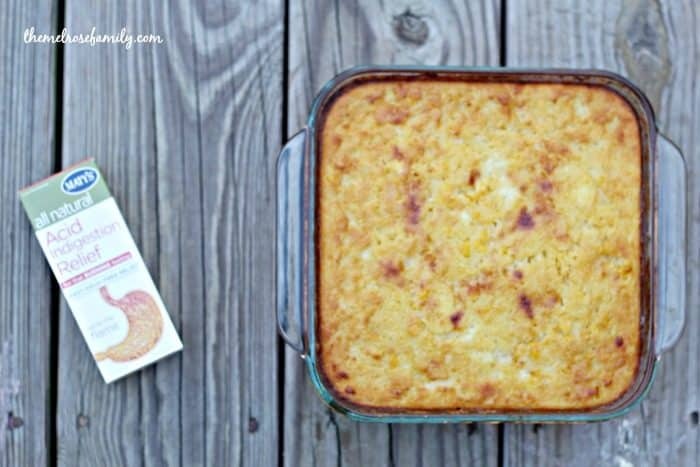 Our Lightened Up Jiffy Corn Casserole is all the comfort without the calories. Plus, it’s one dish and done! This is a sponsored post on behalf of Maty’s Healthy Products. I was recently introduced to the homemade goodness that is a Jiffy Corn Casserole. Not only had I never had it before, but I had never heard of it before either. One bite and I knew my Acid Indigestion was going to flair right up. My go-to for Acid Indigestion Relief is Maty’s Healthy Products because it is fast drug-free relief that is even safe for pregnant women to take. Plus, it helps improve digestion and promotes healthy stomach acid levels. In order to promote natural healing this holiday season, Maty’s is giving away Natural Healing Prize Kits (including a natural digestion kit perfect for that holiday heartburn). Enter to win HERE. 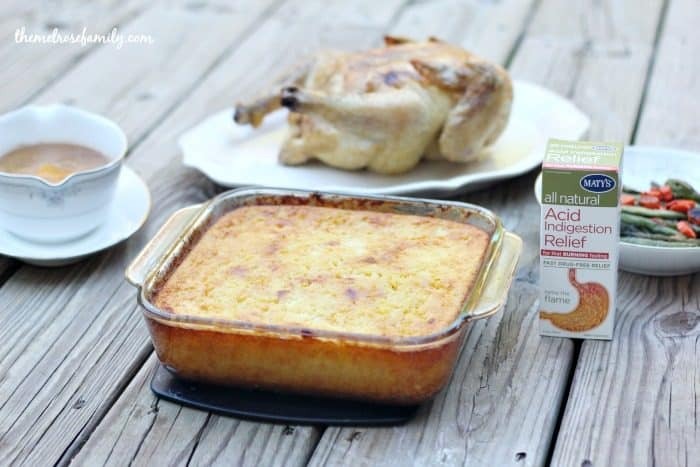 This holiday season I plan on keeping my acid indigestion at bay with Maty’s All Natural Acid Indigestion Relief (which you can buy at Target and Rite Aid). 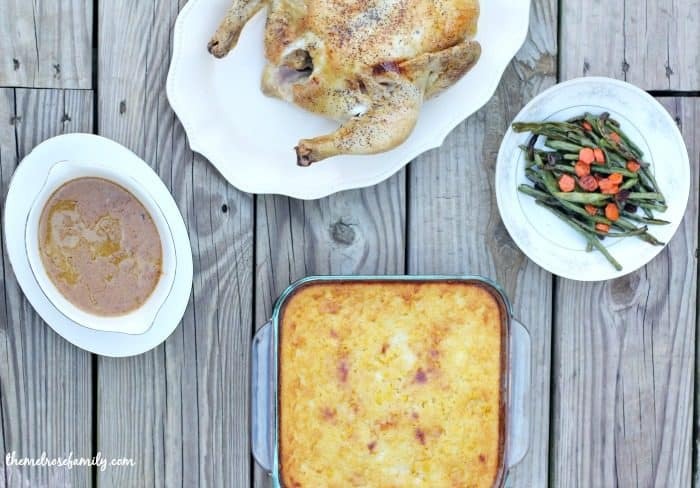 This way I can enjoy my Best EVER Turkey Recipe with my Mom’s Famous Gravy and a big ole scoop of our Lightened Up Jiffy Corn Casserole. You really can’t beat a meal where you don’t need to worry about feeling terrible afterwards. A Jiffy Corn Casserole usually includes sour cream and butter. Clearly, not the best ingredients when you’re trying to stick to a healthier diet. Our Lightened Up Jiffy Casserole substitutes Greek plain yogurt for sour cream and margarine for butter. Plus, we give it just a little bit of kick by sprinkling cayenne pepper on top. If you’re looking for more of a smokey flavor, rather than spicy, then paprika will work perfectly. My favorite part of this side dish is that it’s a one dish item. I hate recipes that result in a ton of clean up afterwards. This one literally gets mixed in the same dish that you bake it in! Ready for the perfect side dish for any meal? 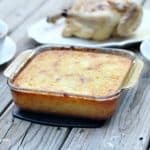 This Lightened Up Jiffy Corn Casserole is perfect for every meal, but especially the holidays. Coat a baking dish with cooking spray. Preheat the oven to 375F. In the baking dish mix the eggs with the Jiffy muffin mix. Add in the sweet corn, creamed corn, margarine and yogurt and mix well. Sprinkle with cayenne pepper. Bake for 40-45 minutes in the preheated oven or until the center doesn't wiggle. Maty’s Mom Tip for their All Natural Acid Indigestion Relief is: If a known food is problematic, take before eating. Follow Maty’s on social media for more ways to combat your holiday heartburn, naturally. Wonder how it would taste with avocado instead of butter?